Kaishoku Michiba: A Restaurant by Rokusaburo Michiba, Iron Chef Japanese Does Michiba Rokusaburō's restaurant cuisine reign supreme? This article is part of a series where the Tofugu team visits Iron Chef restaurants, pitting them against each other in some kind of Iron Chef sequel. Come back and see new Iron Chef restaurant reviews and (coming soon) a final ranking of them all! "Fusion" is a term often bandied about when it comes to Western cuisine, but these days it can mean just about anything—from pad thai pizza to tandoori chicken fingers. Its originality has been diluted into a buzzword that has become shorthand for "anything goes." 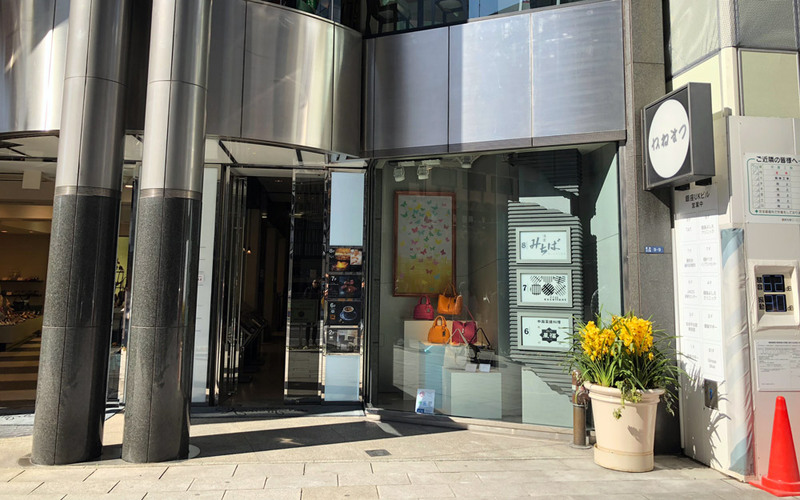 And yet: Kaishoku Michiba (懐食みちば), located on the eighth floor of an ordinary building in the middle of Ginza, takes a traditional approach to fusion cuisine that's as respectful of its past as it is of its present and future. It's owned and overseen by an eighty-seven-year-old chef, Michiba Rokusaburō, whose story is as interesting as his restaurant is superb. We'd made reservations for all the Iron Chef restaurants on this trip, but Kaishoku Michiba was the hardest to score. To come up with its name, Michiba Rokusaburō combined the kanji for 会食 (kaishoku) with 懐石 (kaiseki) and came up with Kaishoku Michiba (懐食みちば)—a piece of witty wordplay that reflects the spirit of the owner's second restaurant. Born in Ishikawa Prefecture in 1931, Michiba began his cooking career at nineteen and hasn't left the kitchen since. Now in his ninth decade, he still visits his kitchens regularly to help create their monthly menus. After working for years in traditional Japanese establishments, Michiba opened his own, Rokusan-tei, in 1971. It was a hit, and more than twenty years later, in 1993, he appeared on the very first Iron Chef Japan. Although Michiba planned to be on the show for only a year, he stayed for three—up to the point when, in his sixties, he could no longer crack a sea bream's head with a knife. In 2000, to fulfill the demand caused by Rokusan-tei's popularity, the celebrity chef opened his second restaurant, Kaishoku Michiba. Our group visited Kaishoku Michiba for lunch in mid-February. We'd made reservations for all the Iron Chef restaurants on this trip, but Kaishoku Michiba was the hardest to score. And although it was impossible to tell from the outside, the restaurant's elegant, modest, warm atmosphere—along with its staff, dressed sharply in black uniforms and bow ties—was evident the moment we stepped off the elevator. 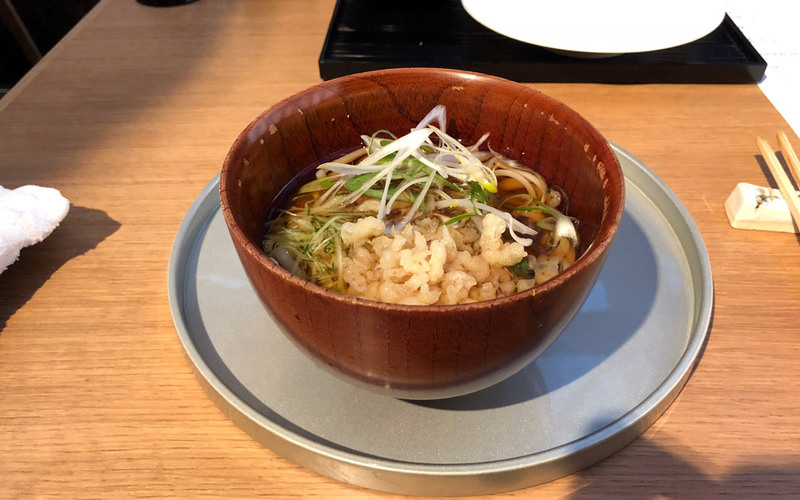 We had reserved a four-top for the restaurant's shortest lunch course, Gohō-zen (五法膳), and were seated at a table by the window, with natural light and a view of the bustling street below. Opposite us hung historic pictures of Michiba and his restaurants' various chefs on the walls and bar. Michiba embraces a "no borders to ingredients" philosophy to his culinary arts, and his menus prove it. As he himself once penned in a note to Morimoto, along with a box of katsuobushi, before a battle in the third season of Iron Chef Japan: "Respect the old, but seek out the new." That was truly what this dining experience felt like. We had to agree that the best dish on the plate (and in fact the whole course) was the seared cube of cheese cured in miso sake lees. 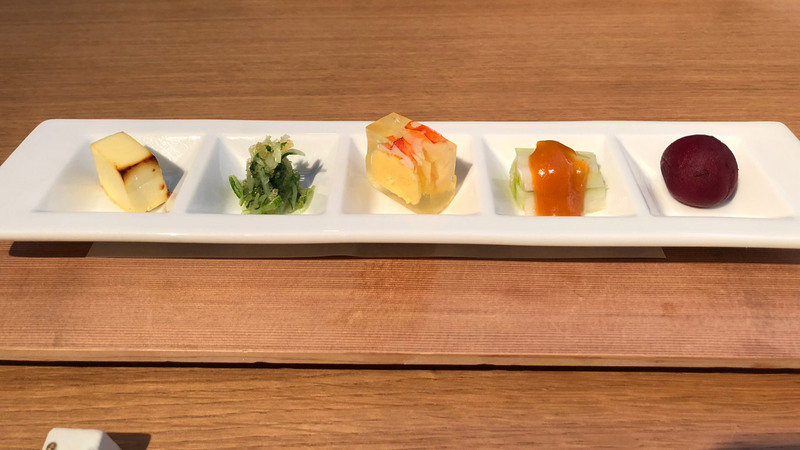 Our first course at Kaishoku Michiba was a plate of mixed appetizers: seared cheese aged in miso and sake lees, boiled mizuna with herring roe, prawn and yam paste set in saffron jelly, blanched wild onion served with spicy miso vinegar, and cherry tomatoes marinated in red wine. Needless to say, the plate gave us the first taste of Michiba's imaginative creations that, made from unexpected food combinations, perfectly embodied his philosophies. Overall, the flavors of the items on the appetizer plate were light and refreshing—they were perfect as a starter. This didn't mean each of those bites tasted similar to one another—each had its own unique flavor and texture, and they all harmonized together. 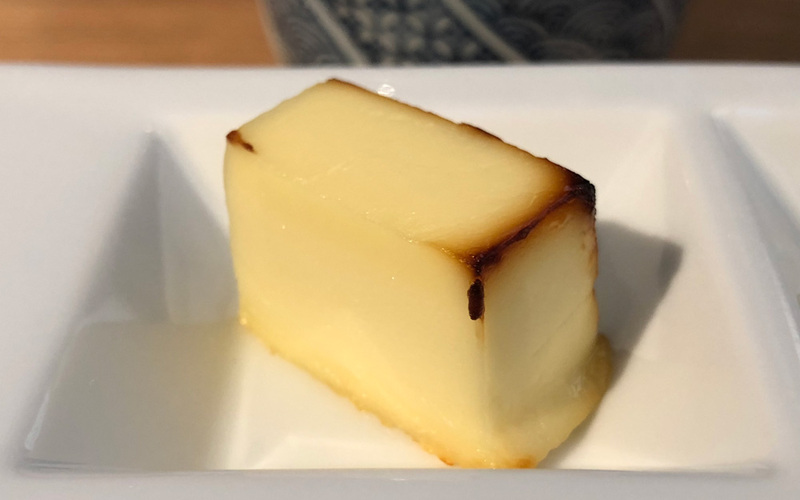 Although all of them were delicious, we had to agree that the best dish on the plate (and in fact the whole course) was the seared cube of cheese cured in miso sake lees. Called 酒粕 (sakekasu) in Japanese, sake lees are the paste-like extras left over after pressing and filtering sake in the sake-making process. Lees are used for various purposes in Japan, and one of the most popular uses is curing food. 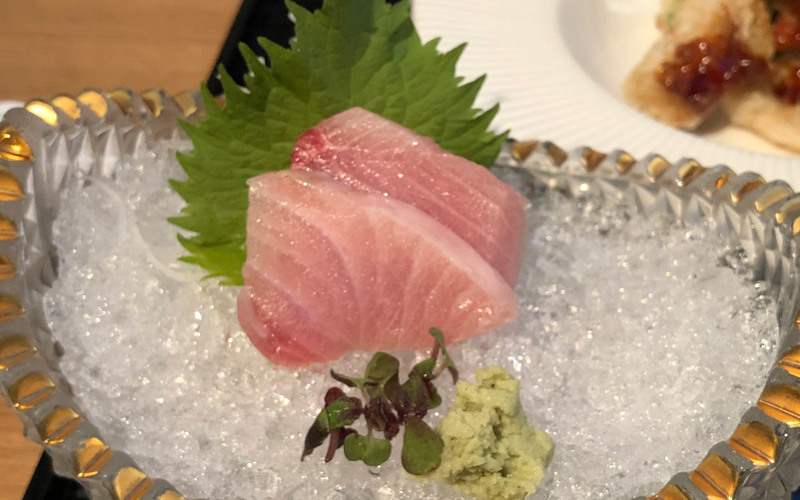 This method is typically used for fish or meat to add flavor and texture, but at Michiba, the chefs mix sake lees with saikyō-miso, which is an elegant, sweet white miso, and use it to make cheese. These techniques (both 粕漬け, curing in sake lees, and 西京漬, curing in saikyō-miso) allow cured food to brown nicely when grilled, and Michiba's saikyō-zuke cheese cube was perfectly browned. The outside was crispy and the inside melted the moment it touched our tongues, revealing an amazing creaminess at its core. This impressive starter is probably Kaishoku Michiba's best-known dish. All of us kept talking about how perfect it was! If you get the chance to visit, order some of this incredible cheese to go—the restaurant keeps a limited quantity on hand as omiyage. It's really no surprise that the creator of this marvelous cheese dish, Michiba, has received commendations and an honorable order from the Emperor, and is nationally recognized as a talented chef and a culinary authority in Japan. With that kind of a pedigree already evident, we were excited for the next course. It was a soup dish: crab fishcake, served in delicate bonito consommé, and garnished with mitsuba herb and yuzu peel. 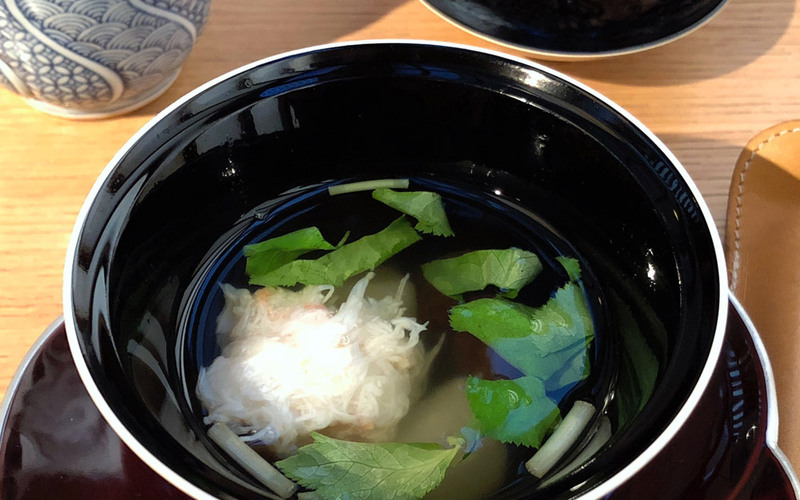 The broth was お吸い物 (osuimono)—clear soup. If you've eaten osuimono, you know how delicate yet flavorful its clear broth can be. Despite looking almost like water, osuimono has a rich flavor consisting of different bases and ingredients. The accompanying 蟹糝薯 (kanishinjo), a crab cake, added depth to the flavor of the broth. Unlike other generic-looking, ball-shaped kanishinjo that use crab paste, Michiba's allowed us to enjoy the texture of real crab. Combined with the hint of yuzu zest and mitsuba herb (which I usually call "Japanese parsley"), it was a nice introduction to the main course. 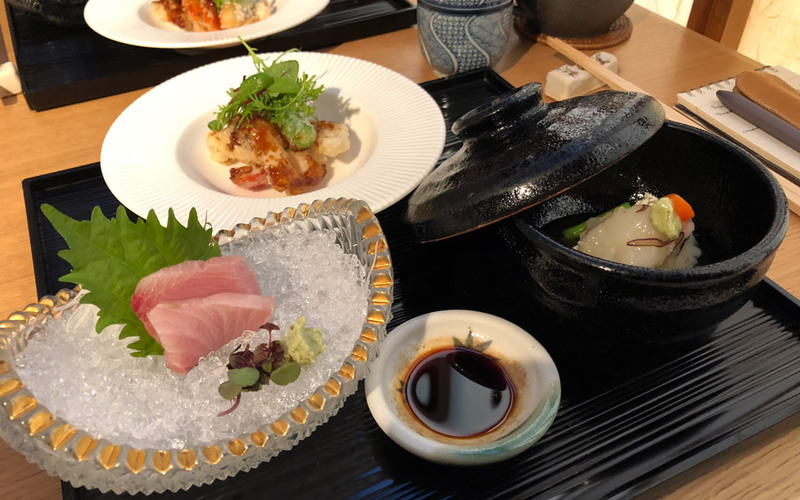 We had arrived at the main course: tempura monkfish, lotus root, and sweet green pepper with Michiba's special sauce; hamachi sashimi and sea bream; and kaburamushi with gingko nuts and kikurage mushroom steamed with grated turnip and flavored with wasabi. The quality of the fish was good, the balance of fat perfect. The menu had identified this entree as simply the "deep-fried fish of the day." I hadn't expected monkfish (アンコウ), and it was a nice surprise. 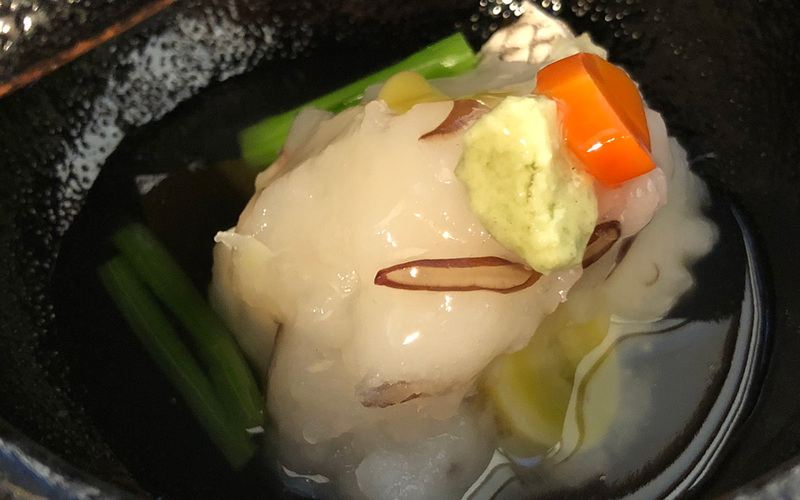 Monkfish is a deep-sea fish with a grotesque look, but Japanese people consider it a delicacy, often comparing it to blowfish, because of its similar taste and texture. 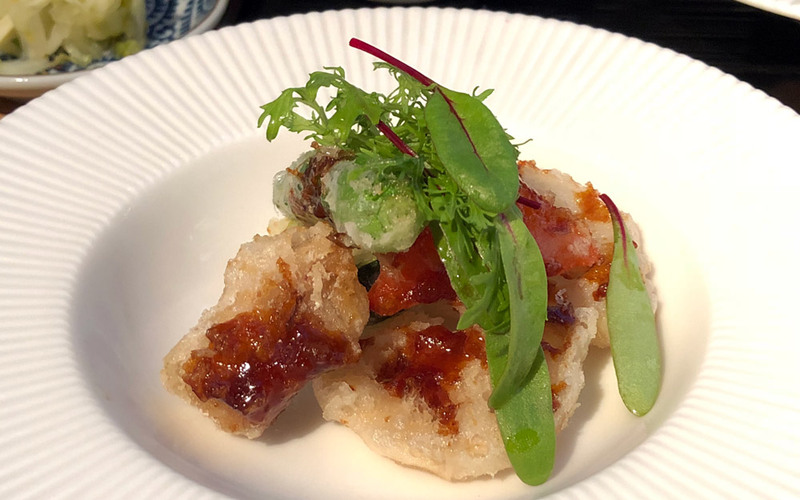 The monkfish with lotus root and green pepper was perfectly deep-fried, its breading neither too heavy nor too light, with a nice crispness that held all the flavors well. The dish was lightly seasoned with Michiba's "special sauce," which reminded me of the sweet soy sauce for a tempura bowl. Kaburamushi (蕪蒸し) means steamed turnip, and Kaishoku Michiba's was actually the first I'd ever tasted. If you look at the picture, the green stuff on the very top is wasabi for accent. 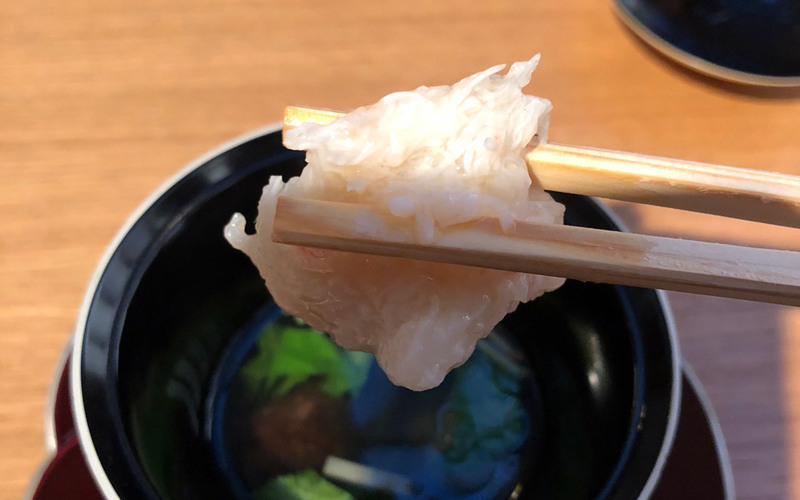 Underneath, the white part is fluffiness made from steamed, glazed Japanese turnip and meringue that covers the sea bream and other ingredients. It sits in thickened dashi sauce. The texture of the whole dish—especially the fluffy turnip meringue—was a big surprise: it was unique and incomparable. Although kaburamushi is a special dish that requires time and technique, this one felt like nice, warm, relaxing comfort food, something to eat on a cold winter night. The main course was served with pickles, miso soup, and a choice of rice or udon. The restaurant also offered a roast beef rice bowl for an additional ¥1,000. We wanted to try everything, so we ordered one. The udon I ordered was simple and good, but I regret not ordering the roast beef bowl. I'd enjoyed enough soupy dishes in the course by that point, and the roast beef bowl was delicious! Koichi ordered one and was generous enough to give us a slice with a bite of rice. 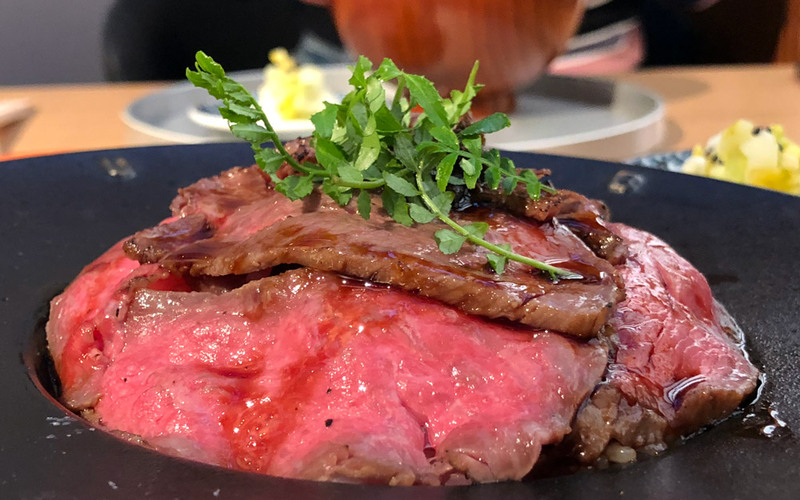 A small portion, but still worth the additional ten bucks, Kaishoku Michiba's roast beef was perfectly seasoned, and so tender that it melted in our mouths. Its jus and sauce soaked into the rice and was a beautiful match. The beef was probably everyone's second favorite next to the cheese, and I recommend it as an upgrade if you visit. The course's finale was sweet purple yam pudding covered in cream. 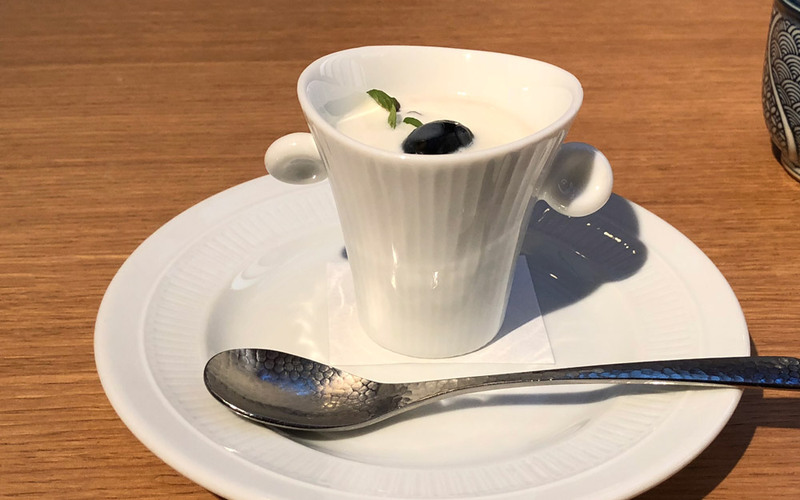 The pudding was a perfect example of not-too-sugary Japanese desserts, its subtle sweetness coming from the flavor of real purple yam. This was served with an aromatic hōjicha tea—a perfect complement. Under the direction of its master, Kaishoku Michiba injects both with a sense of newness without disrespecting tradition. Service was good throughout our meal. 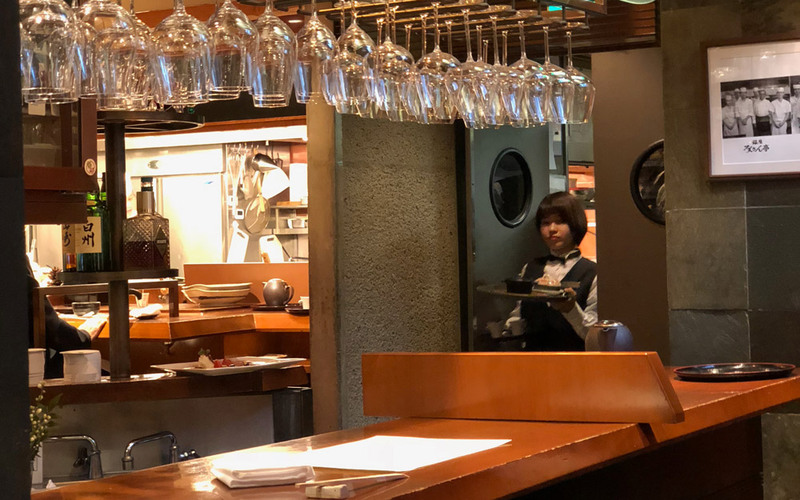 The restaurant staff are the kind of professional, trustworthy servers that you'd expect in a typical high-end Ginza establishment. They spoke some English (and had an English menu available), so I'd have no hesitation recommending Kaishoku Michiba to anyone, even if they're not confident in their Japanese proficiency. If you go for lunch, don't forget to reserve your table (and a box of cheese or two). The restaurant is a popular hangout for Ginza madams and gentlemen, so it's safer to secure your seat first. Even though the lunch course we enjoyed was the shortest of Kaishoku Michiba's basic meals, we still managed to eat thirteen different foods (!) for just ¥3,000 per person—¥4,000 with the roast beef. It was satisfying and a hundred percent worth the price. I'll definitely be back, perhaps in a different season. Kaishoku Michiba was excellent. "Fusion," or whatever the culinary style is called, has been taken for granted and remains under-appreciated, maybe because too many menus are poorly executed with ill-chosen ingredients that don't feel special. 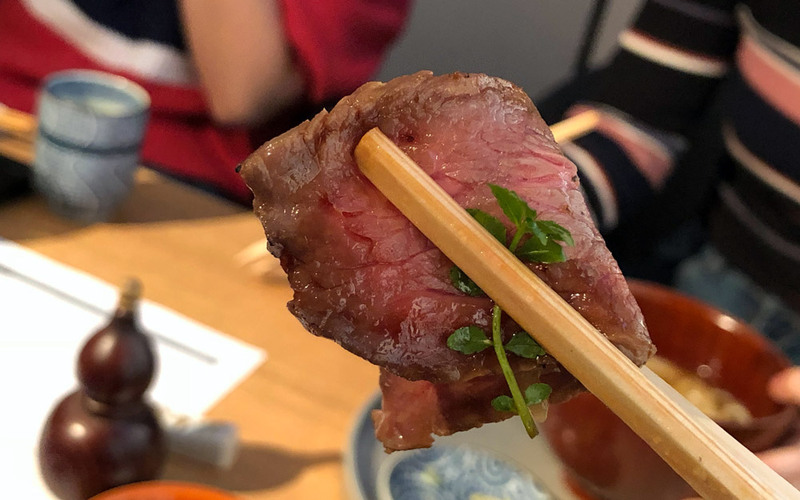 Not here: with its strong, authentic base of traditional Japanese cooking, Kaishoku Michiba serves up dishes that capitalize upon the original quality of ingredients and maximize their potential. And they have Rokusaburō to thank for it. 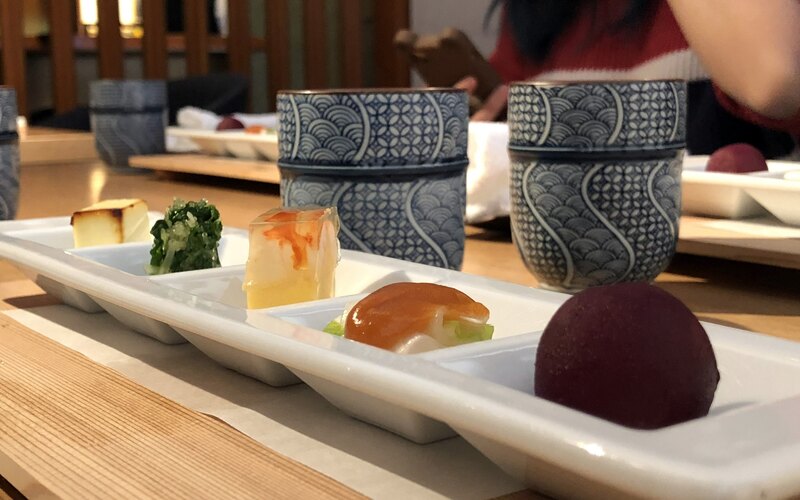 Kaishoku and kaiseki have deep roots in Japanese cuisine. Under the direction of its master, Kaishoku Michiba injects both with a sense of newness without disrespecting tradition. I have no complaints about Kaishoku Michiba. I just wish some of the other dishes would have been a bit more memorably, mind-blowingly tasty like the saikyō-zuke cheese. However, overall, I am content with the whole lunch course. Considering the price, elaboration of each dish, and the variety of the dishes, it was a great deal and I will absolutely come back! Since Michiba was probably my favorite Iron Chef growing up, I was nervous about being disappointed. Thankfully, this turned out to be one of the best stops on our Iron Chef tour. My favorite item on the menu? The single block of cream cheese. You have to go try it to understand. The man has still got it. Everything we had was delicious. It is apparent the high level of skill each dish required. This restaurant is very accessible and definitely recommended if you are in the area. It was a wonderful experience. The food was delicious and beautifully presented. Every course unforgettable. Left the restaurant feeling satisfied, and I’m certain I’ll visit again if I’m ever around again.